Kelly Digges has had many roles at Wizards over the years, including creative text writer, R&D editor, website copyeditor, lead website editor, Serious Fun column author, and design/development team member on multiple sets. Fizz poked her head out of the trench long enough to see that she didn't want to do it any longer. Orc raiders fought in tight formation, and hundreds of her fellow goblins charged ahead of them as shock troops and minesweepers. Bombs exploded, arrows flew, and goblins fell by the dozens. Some of them were probably going to survive the battle. It happened, sometimes. And they were going to come back with an appetite. That's where Fizz came in. Fizz was not, by nature, a fighter. Back in the warren, while her thirty-five (or so) brothers and sisters fought among themselves for scraps of rat and the most flavorful rocks, Fizz had hidden in a corner, stewing armadillos in the shell or frying up some nice crisp toad skeletons. 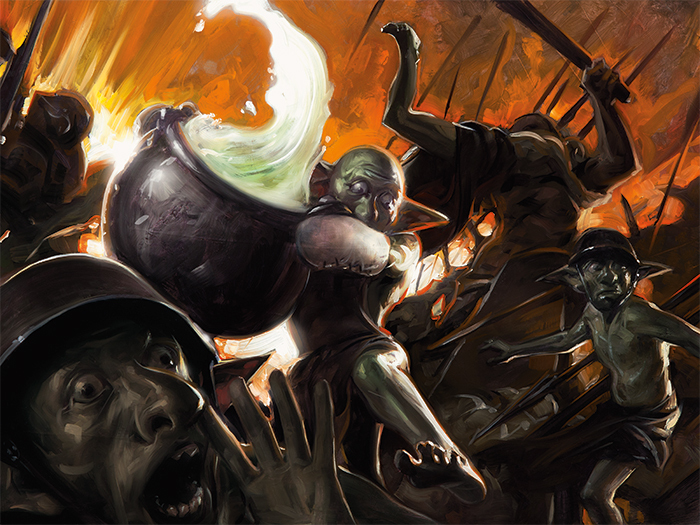 When the orc general Razgar had called the goblin clans to war, Fizz had reluctantly strapped a mixing bowl to her head, stuck a chef's knife in her belt, and joined the ranks. But it hadn't been long before her commanders had taken note of her unique talents, and she soon found herself leaving the 99th Goblin Infantry (the grand old Grag Ridge Expendables) for the relative safety of the field kitchens. On this particular day, she was stewing a thick, bubbling pot of her specialty, Stuff-I-Found-Lying-Around Soup. She fished a boot out of the stock with her ladle and bit into it. She frowned, tossed it back in, sprinkled in a dash of powdered goat, and stirred. "Hot!" yelled the goblin messenger who had just landed in her soup. "Hot, hot, hot!" She grabbed him by the ear, hauled him out of the soup, deposited him next to the cauldron, and tasted. "Field Chef Fizz?" asked the messenger. Fizz saluted with the ladle still in her hand, splattering the messenger with soup. "Message from the general," said the messenger, holding out a sodden piece of parchment. 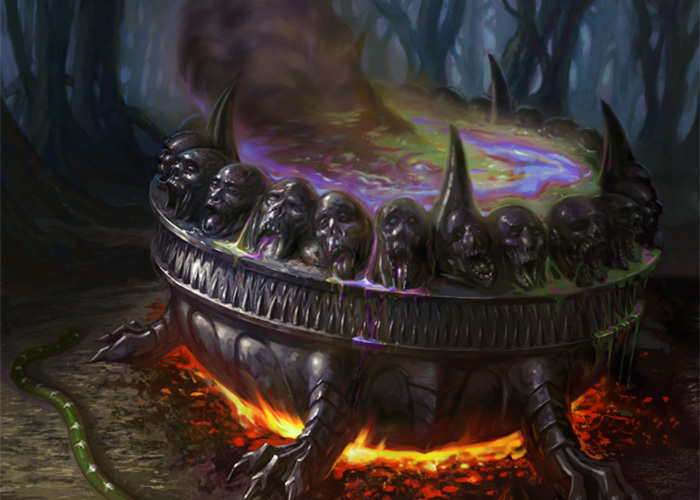 Fizz took it, wrung it out over the cauldron, unfolded it, and read. Her eyes went wide. He rubbed at his ear where she had grabbed it. The messenger licked soup off of his nose and nodded appreciatively. The messenger scratched his head. "...in the middle of a battle?!" "Can't read," he said cheerfully. "That's why they made me a messenger! It's called security." Fizz, unfortunately, could read. The General's note was quite specific. Lunch, now, in his tent, all the way across the battlefield. And it had better be hot when it gets there. She peeked over the wall of the trench again, at the terrible, deadly chaos of battle. She'd never make it through that alive, never mind without spilling the soup. Fizz straightened. Never say never, or at least almost never, as her mother used to say. This was her chance. Today was her day. She was born for this. "Tell the general I'm on my way." "Huh?" said the messenger. "I'm stayin' here. You tell him." He grabbed a bowl and filled it from her cauldron. "I'm on my lunch break." Fizz pulled a bandolier off the wall and filled it with shakers of salt, pepper, and two kinds of beetle carapace. Like she always said, spices were the spice of life. She tasted the soup one last time, hauled the cauldron off the coals, and lifted it with a grunt. She'd have to cross the battlefield, but she was going to go as far as she could in their own trenches. This was, after all, an important mission. Fizz dashed down the trench, soup in hand, trying not to spill a drop. Rocks and arrows rained down. Some fell in the soup. That was all right—they'd add flavor. She ran through the chaos, stepping over other goblins, running between the legs of orcs, and ignoring the shouts of surprise that followed her down the narrow trench. 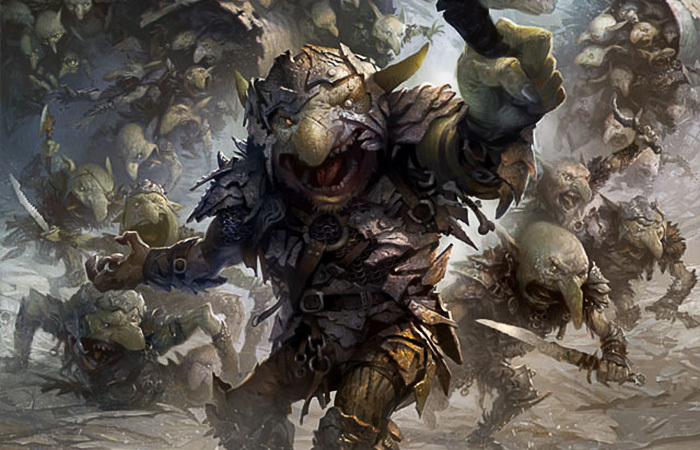 The way ahead was blocked by a squad of nervous, milling goblins. She slowed and stopped. "Um, excuse me," she said. "I'm on an urgent mission for the general!" Nobody moved. One of the goblins picked his nose at her. She tried to shoulder past. "Move!" she said. They didn't. Fizz took a deep breath. ...until she tripped over someone's foot. The soup cauldron left her hands and tumbled through the air. She dove and caught the hot cauldron, landing hard but managing not to spill more than a bowlful. She stood up, dusted herself off, and looked around. Behind her, the source of her near-disaster, was a goblin minelayer. Was that a bomb? Yes—yes, it was. A fuse stuck out of the mound of dirt, burning down. "What...what are you doing?" asked Fizz. She backed away. "Diggin'," said the minelayer. "Bombin'." A shrug. "Gotta do it somewhere." The fuse was quite low now. "Never mind," said Fizz. "I...I can see you're very busy." The explosion was very loud. Her ears popped, and dirt showered down around her. Well, mostly dirt. Fizz rounded a corner and skidded to a halt behind a line of goblins carrying large, hot cauldrons. Was this the lunch detail? Had the general ordered a lot of soup? "Ember haulers ready!" yelled an unseen sergeant. 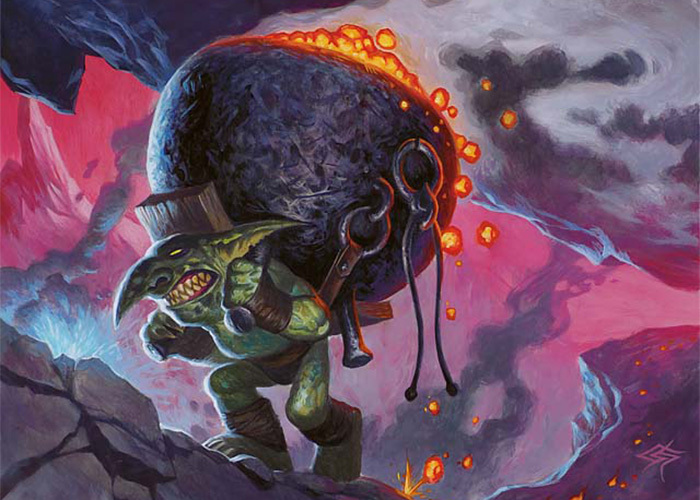 Fizz began to back away, but bumped into another goblin carrying a huge cauldron who'd lined up behind her. Fizz turned to apologize as coals spilled out and fell on the goblin's nose. She yelped and glared at Fizz. The goblin behind her pushed against Fizz's back. Fizz shrugged, hefted her soup cauldron, and ran up a ramp and over the edge of the trench with the ember haulers. Bombs exploded. Goblins cowered. Orcs yelled. In the distance, humans in gleaming armor charged, waving shining swords and long, wicked spears. In the middle distance, the general's pennant hung limply above a large, grubby tent. She was getting close! Around her, the ember haulers spilled their cargoes with a hiss, and sometimes screamed as the hot coals showered down. For a few lucky ones—comparatively lucky, anyway—they succeeded in their mission, and it was the enemy screaming. Fizz hot-footed her way across a swath of embers and kept running. Goblins milled around her. Orcs barked orders. The thin, mewling sounds of human speech were barely audible, even though she was pretty sure the humans were yelling at the top of their lungs. Huffing and puffing, Fizz paused to catch her breath among a group of goblin irregulars who were cowering inside a large crater. "Not for you," Fizz said. She puffed out her chest. "I'll have you know this is the general's lunch." "Ohhh, the general," said another. "He's already sent us to die once. What's he gonna do if we steal his soup?" "He'll have you drawn and quartered and...and...and stewed!" "Least then I'd have some food," grumbled a third. The irregulars surrounded Fizz and her soup pot. "You will not steal the general's lunch," said Fizz. "I...I won't allow it. Think of...think of..."
"Think of the lads and lasses back home!" yelled a booming voice. There, at the edge of the crater, stood a dashing figure, sword upraised. "Think of all o' them sittin' in their warrens, warm and safe, with plenty to eat. Why, they're probably back there thinking to themselves, 'I'm sure glad I ain't fightin' in no war!'" He paused. Fizz held her breath. The irregulars leaned in expectantly. "Uh, wait," he said, scratching his head. "That kinda got away from me." The irregulars glanced at each other. "But the point...?" said Fizz. "Right! The point," he said. "The point is...see, what I meant was...well, we're all in this together, and if they don't hang us separately, it's probably because they hanged us all at once. Or...something. Anyway, as a great general once said..."
He raised his sword high and pointed at the humans' trenches. The irregulars cheered and ran toward the enemy battle line. Fizz was simply swept along. "No, wait, I need to—"
She tried to charge back the way she'd came, but they were all around her. Behind them, the goblin who had inspired them cowered in the crater they had vacated. They ran in a howling mob, pulling Fizz along. Her soup sloshed dangerously. Then they were over the lip of the enemy trench. Fizz landed on a pile of groaning irregulars. She scrambled off, and they ran charging into the trench system. Fizz looked around. The trenches were straight and neatly excavated, with tall sides that didn't slope even a little. She hunted desperately for an exit, but soon heard boots approaching and the squeaky voices of humans. With no other options, she set down the cauldron and hid behind it. "—don't know why we even bother," one of them was saying. "The way they fight, they'd kill themselves off if we just left them alone." "You know that's not true," said another. This one had an even higher voice. A female? "They breed like rats and they fight like rabid dogs. With the orcs in charge, they could overrun the whole western reach." "Ought to go into the mountains and kill 'em all off," said the first voice, drawing still closer. "Drag 'em out of their warrens and—"
Fizz seethed. The humans rounded the corner, and the first soldier cut himself off. "Hey, the lunch detail showed up for once!" Oh, no. No no no no no. "Are you sure?" said the second soldier. "That stuff doesn't smell right." "I'm too hungry to care," said the first. The clatter of bowls. A sloshing, sucking sound. Fizz peeked out around the cauldron as the human lifted a spoon overflowing with Fizz's signature soup, blew on it, and stuck it in his mouth. His face turned red, then green, then purple. He keeled over. The second soldier backed away in horror. "Chemical attack!" she yelled. "Ward spells, now!" She ran down the trench. Fizz crawled out from behind the cauldron. The soldier had stopped twitching. "Drag you out of your warren," mumbled Fizz. "Jerk." Standing on his breastplate, she was just barely able to lift the heavy cauldron out of the trench and scramble up after it. The battle seemed to be going their way. But she had to hurry. Still distant, further to her left than she'd been expecting, was the general's tent. She started running. She ran through a quiet section of the front, where the battle had moved on. She reached the top of a heap of dirt and saw an opportunity. There, sitting on the ground, was a half-deflated goblin balloon-toad. The toad wheezed contentedly. The gondola lay on its side, and two crew-goblins argued about whose fault it was. "I'm on a very important mission for the general," said Fizz. "I need to get to his tent right away. Fly me there, and your reward will be...something, probably!" "Beats waiting here for the humans to come back, I guess," said one of them. "Is that...soup?" said the other. "You bet it is," said Fizz. "Go!" "Well, you heard her!" said the first crew-goblin. "Inflate the toad!" "I'm standin' right here," said the other. After much grousing, some frantic inflating, and only a little bit of frog drool in the soup, the balloon began to rise into the air. "Get in!" said one of the goblins. The gondola rose just barely off the ground. "No time!" said Fizz. "I'll want to land in a hurry." She wrapped a dangling rope around one arm, looped it around the soup, and hung on. "That," the other goblin called from above her, "is the stupidest thing I have ever seen." General Razgar sat in his tent, trying to concentrate on the battle map through a growing and especially surly hunger. His stomach growled loud enough to hear over the sounds of the battle. "Where's my soup?" he bellowed. 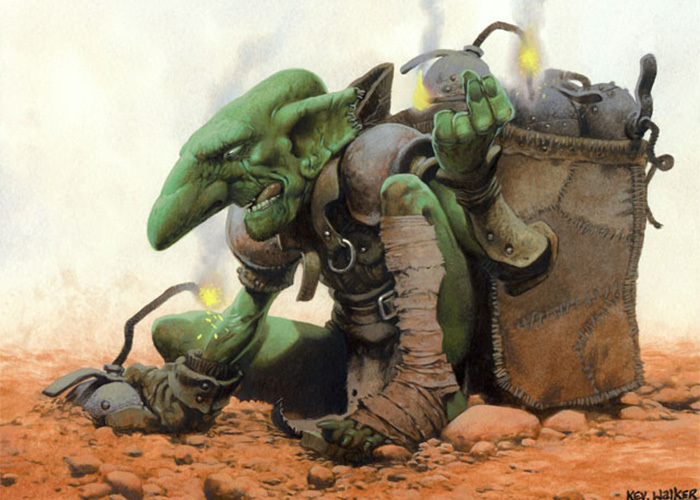 "I-I-I-I-I-I sent a messenger," said Yort, his goblin adjutant. He groveled. He was absolutely pathetic, and Razgar liked him that way. "I'm s-s-s-s-sorry, my lord!" said Yort. "I'll send more. I'll—I'll send dozens! But you said you wanted the best, and Fizz is—" He paused and cocked his hears. "What's that noise?" Goblins had sharper ears than orcs—one of their very few advantages, besides sheer rate of reproduction—so it took a moment before Razgar heard it too. 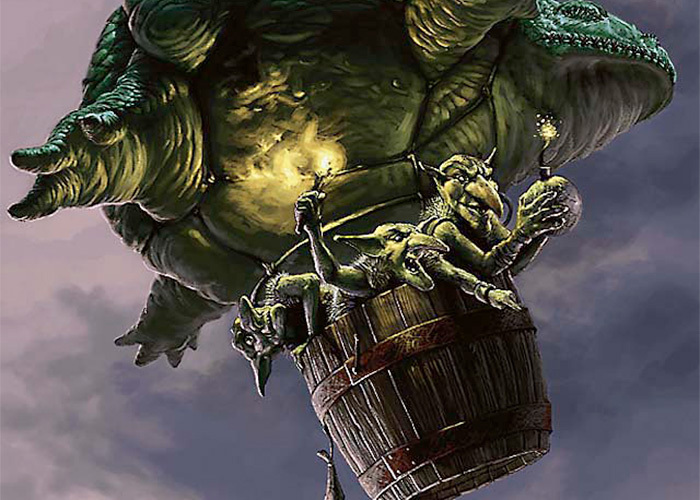 Yort opened the side of the tent to reveal an absurd sight: a goblin civilian holding an oversized cauldron dangling from a goblin toad-balloon. The goblin skidded into the tent, tumbling head over heels and landing with a grunt in a pile of maps. The cauldron of soup thumped to the ground in front of the general, sloshing slightly. It was still piping hot. The goblin chef climbed out of the pile of maps and saluted. She came up to Razgar's mid-thigh. "Field Chef Fizz, reporting for duty as ordered!" she yelled. "At ease," said the general. "Well then, Field Chef. Let's see if you're as good as they say..."
He hefted the entire cauldron, lifted it to his lips, and began to drink. It seared his throat and filled his belly and made his eyes water, just like a good soup ought to. "Yes, sir," said the chef. "The red kind and the shiny kind, sir." He drank the rest of the soup, set the cauldron down with a clang, and wiped his mouth on his sleeve. The goblin chef waited anxiously. "Good work...Field Chef, First Class." The newly promoted chef beamed with pride. The general had just made up the position of field chef, first class, but it seemed to make her happy. "Yes," he said. "That was very good." He gazed out at the battle still raging. They were winning, but there would be many hours of mop-up. "In fact," he said, "I think I'll have another."